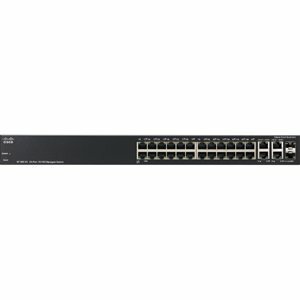 The SF300-24P Managed 24-Port 10/100 PoE Ethernet Switch from Cisco is a feature-packed, 28-Port Fast Ethernet switch for your network. Because each of these twenty-eight ports features Power-over-Ethernet, they can distribute power to external devices connected to the switch, such as Access Points, IP cameras, and external storage drives. Beyond these ports, this switch also features four Gigabit Ethernet ports, two of which can operate as either mini-GBIC Ethernet or as standard RJ-45 Ethernet gigabit connections. With these particular ports, you can connect gigabit or fiber optic devices to the switch.